Did you know Christmas is almost here? I'm sure that, unlike me, you're on the ball and all ready. I actually made these brownies for a Halloween trunk or treat party (as evidenced by the styrofoam plate and hastily shot picture) and haven't had a chance to post yet. My little chickens keep getting sick and like nice children they are sharing their germs with their parents, so we've all been a little crazy! Today I finally got the lights on the tree and my little man is excited to cover it (or the lower half anyway) with ornaments. We made some homemade cinnamon ornaments that were quick and fun- I can't wait to share them with you next week. My house smells wonderful. I love Christmas time even though it's plenty busy! It feels like we have some get together every spare minute in December. These brownies are the perfect accompaniment because they come together in a flash (five or ten minutes, really, and you can taste the brownie batter along the way so you won't mind the time, or is that just me?) I swirl in some softened cream cheese and a can of Lucky Leaf cherry pie filling and they actually feel fancy, are super easy, and taste SO good. I didn't used to like cherry pie filling. I'm not sure what I was thinking there, but now that I'm a "grown up" I've changed my ways. Lucky Leaf is also having a recipe contest that you can read about here. I have a few more cans of their yumminess in my pantry that I'm going to experiment with. Let me know if you enter- and you should, there's a prize and a trip to their bake off! Make the brownies as directed on the box and pour into a pan lined with parchment so you can lift the brownies out later. Spoon the pie filling evenly over the top. In a mixer or bowl, combine cream cheese, egg, sugar, and vanilla until perfectly smooth. Using a large spoon, divide it over the brownie batter in random piles. Use a butter knife to swirl everything together and bake for about a half an hour or until they reach your desired "doneness". How you manage to make such good stuff in the midst of toddler and infant mommyhood is amazing, Anne! I don't think I did much baking at all when my two boys were so little. This looks like a quick yummy treat. What a dreamy dessert. I imagine I could make my own brownies and go from there. We have someone on a gluten free diet and obviously can't use the mix. Everytime i follow this the brownies come out soggy....what am i doing wrong? Hi Charles, Sorry your comment was stuck in my spam folder accidentally and I just retrieved it. I don't know why yours are coming out soggy- that's never happened to me. 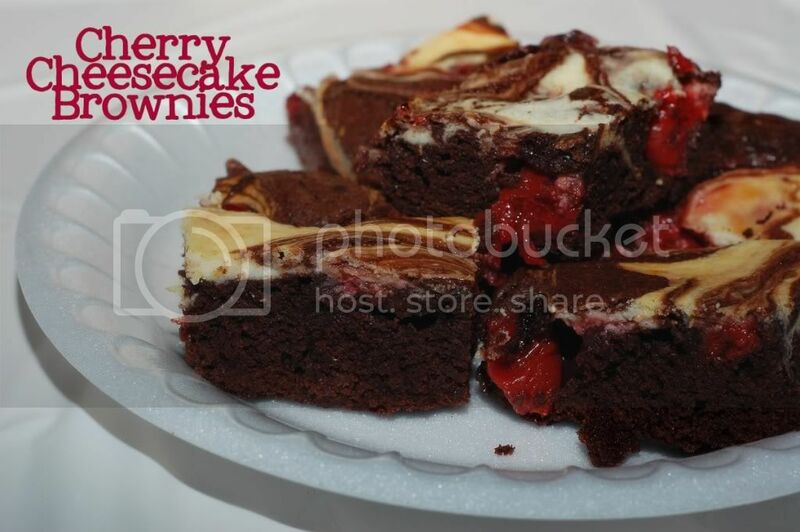 I would say you could omit a little of the liquid in the brownies themselves or try to pull out just the cherries and leave the 'juice' behind from the pie filling. Hope that helps!